In order to have poison free aquarium water, the filtration process is very important to the aquarist. Since most aquarists are aware of the fact that their aquarium water gradually accumulates potentially harmful substances, which eventually poison their fishes. In order to prevent this from happening there is a need for filtration, therefore, for our purpose, I would define filtration as the removal of unwanted substances from water. chemical amongst which the biological is the most important. Biological filtration is also referred to as undergravel filtration because the major equipment used (a flat plate of perforated plastic) is placed under the gravel bed hence it is invisible. Unless you are properly equipped, you can’t see the process happening and cannot measure its effect. Yet this process is the major difference between success and failure, and the aquarist who does not take the time to understand its workings is doomed to watch an endless procession of dying fishes passing through his tank. Biological filtration is solely the work of bacteria attached to the surfaces of the gravel, the grave and the under gravel filter together constitute the filter bed. Bacteria normally reach the filter bed through the food you give the fishes. The waste product of the fishes, the air, and even by your hands as you are working in the tank. What The Fuss About FISH TANKS? Fish tanks come in many shapes and sizes. It ranges from a small one-quart to a 55-gallon aquarium. The concept of fish tanks has changed over the years. It used to be viewed as a glass container for fishes, but now, a fish tank can also be viewed as an art or an aqua furniture. For some homes, fish tank has become a design piece of art that is placed in the living room. The focus is no longer the fish, a rather the fish tanks. These fish tanks can be designed to fit comfortably into a corner or all be recessed into a wall. Some fish tanks are built within the wall, framed by wood and appear to be a living painting. And for some, the fish tanks are specially designed to feed into specific needs. The materials used to build fish tanks have also changed over the years. The traditional material used to be glass. This is slowly replaced by moulded acrylic as the primary material. The advantage to using this as a primary material is that it reduces the breakage danger, and prolong years of enjoyment with your fish tank. Fish tanks are not complete without its accessories. These accessories not only helps decorates fish tanks, but it also helps to keep the fish healthy and happy. You do not require a huge investment if you have only a few fishes in a bowl. However, if you plan to raise bigger and more fishes, then you certainly need more accessories for your fish tanks. If your fish tanks hold 10 gallons or more of Water, then a water pump and filter will help to keep the water clean and moving. Otherwise, you would need to change the water frequently as they get it begins to get dirty easily. The water needs fresh air to be introduced constantly, otherwise, the fish will suffocate. This is where the air filter comes in. The air filter helps to keep the air floating through the water constantly. A light fixture that attaches to the top of the fish tanks help provides light into the water; it helps to keep the fish from sleeping all the time. If you live in an area where temperate changes constantly, then you may want to consider installing the heater to keep the water at a constant temperate. This will help to ensure that your fish won't be cooked as the water gets too hot or, becomes lethargic if the water gets too cold. The fish tanks accessories are pretty standard. But if you have unusual fish tanks shapes, then you will certainly need a manufacturer to design and build the accessories. Given all the accessories, these fishes still need proper care. How healthy and happy your fishes depend on the amount of time and effort you put into the care of the fishes and the fish tanks. The Association of Zoos & Aquariums was established in 1924. Known simply as AZA, the organization is not for profit. It is dedicated to ensuring all of the animals at the various zoos & aquariums have the very best elements in place. They have strict guidelines for the way these animals are to be cared for. They offer their accreditation only to those locations that continually strive to follow or exceed those guidelines. This type of accreditation is very important. People that visit zoos and aquariums are very interested in the efforts for wildlife conservation. They won’t frequent a place that doesn’t uphold the very best of standards. Not having such an accreditation can prevent a zoo or aquarium from getting the animals they want. This can result in lower attendance too because they don’t have the main attractions that appeal to large audiences. The AZA is also very involved in educational programs that promote the well being of animals. They like to make people of all ages more aware of the impact that animals have on our own lives. They want them to be aware of how their own actions can be a positive or negative impact on such animals. This is why so many zoos and aquariums allow schools to bring in busloads of children for field trips on a regular basis. The images of what is taking place and the educational materials can be planted into their young minds for them to carry with them as they become adults. AZA takes any complaints from employees and guests at zoos & aquariums very seriously. They will take the time to look into such issues and explore the options for effectively resolving them. They will also randomly send representatives out to the various zoos & aquariums to make sure they are indeed doing thing correctly. AZA continues to develop and implement better ways to house the animals at zoos & aquariums. They want to give them the best environment to live in that is reflective of their own. They also want to ensure people are able to get a good view of these animals. Safety is a very important part of making sure both people and animals can enjoy the atmosphere at a zoo & aquarium. A fifty-five-gallon freshwater aquarium is a good choice when purchasing a new tank, if nothing else, simply because of its size. These tanks are large enough to accommodative a variety of fish, but still small enough to keep in tight spaces in the home or office. Your local retailer can assist you with specifics in purchasing, but here are some suggestions for the basics. Purchase an acrylic tank, because they are lighter in weight and easier to care for than glass aquariums. Also, the visibility is better in an acrylic tank. If you don't already have a stand or a suitable replacement, keep in mind that you will need to purchase one. You will need a heater for temperature control, and a thermometer for checking the water temperature. It will take approximately five bags of rock or other substrates to line the bottom of the tank. Choose a bright color to add some interest to the aquarium. The aquarium will also need lighting. Again, based on personal preference you can keep it simple or get very technical. Most fish will respond nicely to a basic light that is simply turned on for a few hours each day. 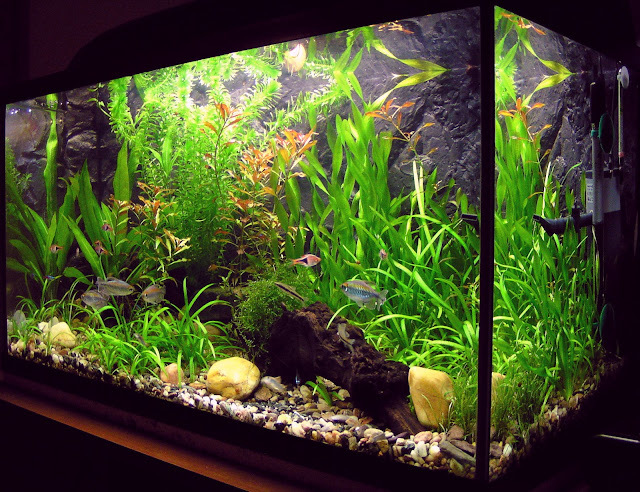 An aquarium should contain some form of plants for added interest. The plants serve a place for the fish to seek refuge and feel safe. There are many varieties of freshwater plants that would work nicely in a fifty-five-gallon aquarium. Just be sure to purchase an aquatic specific species. If you don't want the hassle of live plants, plastic is always an option. They have come along way with synthetic plants. In most cases, the fish may not even notice the difference, unless of course, they try to eat them. Once your tank is established and you are ready to add fish, choose your fish carefully. Start with hardy fish, such as livebearers, gouramis, barbs, and danios. These fish are hardy enough to handle higher nitrate levels in the tank. Allow about thirty days for these fish to become acclimated to the tank, before adding any new fish. It usually takes about thirty days for the symptoms of ich or other fish illnesses to show up. It is important to make sure that all existing fish are healthy before adding any new species. The transportation of new fish itself is stressful enough, without having to add disease to the situation. When purchasing fish, it is important to remember that a fifty-five-gallon aquarium can handle about fifteen to twenty small fish total. This will allow plenty of growth room for the fish. The history of the freshwater aquarium and aquariums, in general, are varied depending on who you speak to. What is important today is how aquariums evolved and what they have evolved into. Also, the fact that aquariums do have a history, and it is rather interesting. From ancient Mesopotamia to modern-day Miami, aquariums have been apart of human life and have been written about by countless people who for one thing, liked their entertainment appeal as well as the reported soothing effects on the king and queen of ancient times. The many ancient drawings, carvings, and pictures of aquariums from places in antiquity like Eqypt and Sumeria show us that these past peoples knew the beauty of the tanks and they also desired to maintain that beauty and pass on the secrets of these creatures. The ancient Romans were also known to have traded live fish as commodities in their agoras (markets). Cultured live koi – that familiar fish with the red, white and black coloration, was already a commercial item in the old trade routes that spanned China, Japan, and Europe around the 16th century. 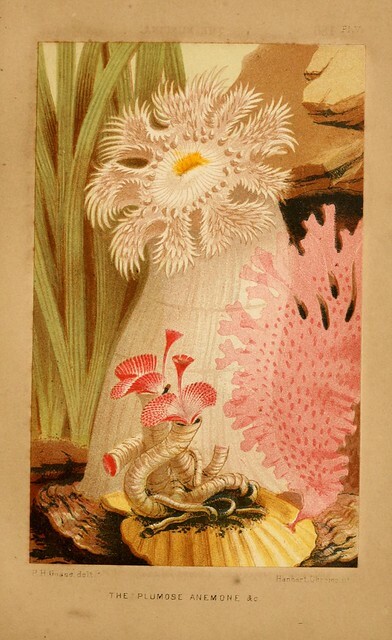 Later, its reputation also grew and became very popular. Much later, it was also exported to Europe and America. 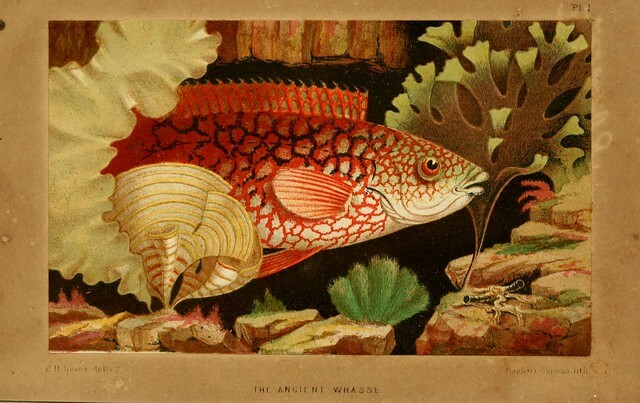 In the early 19th century, aquarium-keeping began. England, Germany, and France all vied to top themselves in mounting exhibits of public aquariums. It did not get a good reception as many were appalled by it. At that time, there was very poor understanding yet on the various roles of water chemistry, the nitrogen cycle, filtration, and aeration. The size of the tanks was also limited by the holding power of the construction materials then. Three years after, many Zoo’s and farms began to open the first public aquariums one after another when they noticed a good turnout. Soon, public aquaria were all over the major European cities patronized by eager but intrigued visitors. The first constructed tanks leaned more to the ornamental side rather than being functional at best. Most early designs featured a glass front and three wooden sides (They were sometimes constructed from slate). They were coated in pitch to make them watertight. Soon, these construction problems were overcome little by little. There was a real breakthrough with the development of silicone sealants. At around this time, a better understanding of the needs of the tank’s fish inhabitants led to the invention of the heater and the thermostat, as postulated by a Mr. Humphreys. In maintaining fish, this person would be the one to mention the significance of the tanks chemistry toward the safety of the fish. With a deeper understanding of water chemistry and other related matters, filtration and lighting were soon recognized as additional important elements to the total upkeep of the fish in the aquarium. Many killifish species are assigned with complicated names as compared to the other species of pet fish. Sometimes their names consist of two or three words and a number. If you are not an experienced fish-keeper and you visit a pet fish store, you will be confused with the long names and numbers. But remember, there is a logic behind their names. Let us take an example of ‘Baira 98′. You may not be able to understand anything by reading this name. However if you just inquire with the pet shop staff, you will find the rationale behind it. Baira is the name of the village in Africa from which this fish was discovered and the number 98 represents the year in which it was found. So the fish was found in 1998 in that village. Sometimes there is no number assigned. In that case, it indicates that the fish might have been found in many places in the world and no specific year can be attached to it. So if you find a name ‘Northobranchius rachovii’, it will mean that the fish does not have any specific place or year to relate. However, things are not that easy all the time. Sometimes the species is known with different names. Let us take the name of Northobranchius andersonius. When the famous explorer Anderson visited Africa in 1915, he had seen the species and he gave this scientific name. However, some other explorer went to the same place in 1920 and when he found the same species, he named it as ‘Northobranchius victorii’. The reason behind such remaining was the memory of his wife Victoria. Now the same species is known with two different names! There is one more reason for the change of name. There is one system called taxonomy under which all species can be placed. As we explore new things, the mistakes in the previous names are revealed. The testing of DNA may suggest that the fish which was named Northobranchius is not belonging to those specific genera. However, it is belonging to some other genus from Africa. In that case, the name is changed but the old name will still remain on the records and it will continue. In fact it may continue for years unless someone takes it up as a campaign to change it to the correct genre. For all these reasons, in the fish-keeping community, it is common to use the popular names or common names instead of scientific names. 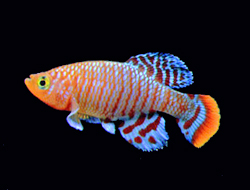 For example, Pseudepiplatys annulatus is called clown killifish and it is famous with the common name itself. In the same way, Aphyosemion cinnamomeum is called Cinnamon killifish and Aphyosemion austral is called Lyretail killifish. Do not nervous by scientific names. Just ignore them and get familiar with the common names. Life will be easier that way! Fancy goldfish make an excellent indoor pet for a number of people with busy lifestyles and the craving for pets and some form of companionship but not the space in their homes or their lives to actively care for and raise pets like dogs or cats. Goldfish have many advantages that pets that have legs don’t enjoy and they are a very low maintenance but a very therapeutically beneficial pet. You never need to take a goldfish for a walk early in the morning or even when it is raining. Sometimes you are just not in the mood for a walk even if the conditions are perfect. This is not an issue with goldfish. Most pets are hideously expensive. The cost of raising an average size dog has been estimated by some studies to run into the tens of thousands of dollars which is a sum that few of us can really afford. In these hard economic times where everyone is trying to cut back on expenses and reduce spending around the house, your dog may not be such a great pet if it is almost as expensive as bringing up a child. Dogs are expensive to buy and the costs continue throughout their lives. They need to be inoculated and fed with expensive food and later in life when they need medical care that is a very costly proposition too. Fish are cheap and easy to buy and so easy and absolutely painless to maintain that you could even give them as a gift to someone without wondering whether they will be able to take care of them and will not find them to be a burden. Dogs and cats can quickly turn into white elephants when given as gifts no matter how cute and adorable they are as kittens or puppies. Fancy goldfish make an excellent indoor pet for a number of people with busy lifestyles and the craving for pets and some form of companionship but not the space in their homes or their lives to actively care for and raise pets like dogs or cats. have no such issues. Their short lifespans mean that you do not have to worry about long-term care for them. When they die you can decide if you want to get another batch and you are never stuck with them. This is also very important when you are going on vacation or leaving town for business. You do not have to worry friends with requests to come over and watch and feed your pets with goldfish and you do not have to worry about paying the exorbitant fees that kennels and doggy day care centers charge. So get yourself some goldfish today. They make great pets and they are relaxing to watch. 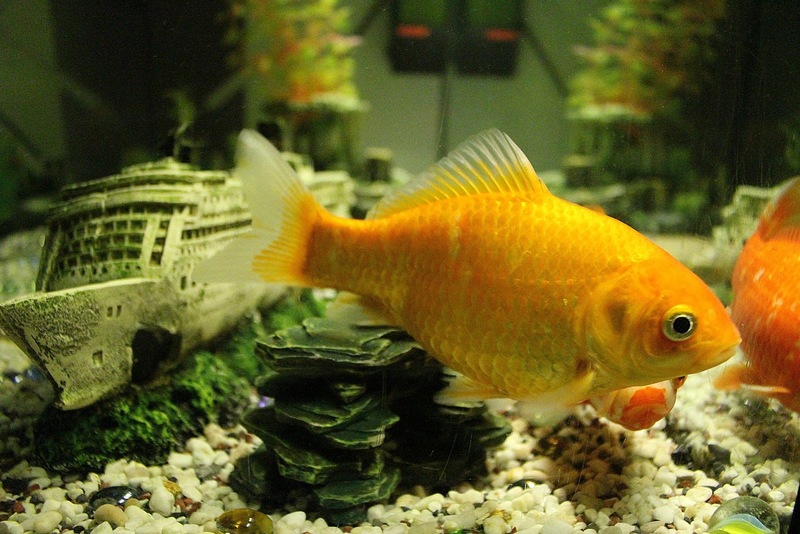 Aquarium owners enjoy the luxury of keeping fish and other underwater pets for pleasure. Since a properly maintained and presentable aquarium can entail investment, the fish lover is keen on perfectly displaying and enhancing the appearance of his pet. Animals and fish look best in their natural habitat. The environment of their natural habitat can be recreated within the aquarium by using aquarium backgrounds . These backgrounds are available in various shapes, sizes, and colors depicting underwater natural scenes. They are made of materials which are not harmful to the fish and can be placed inside the aquarium or outside. The backgrounds have several practical and aesthetic benefits. They are attractive decorative items that enhance the overall appearance of the aquarium by increasing its depth. By concealing the cable, tubes, and cords that clutter the back of the fish tank, they present a neat and natural look to the aquarium. Inside an aquarium, algae build up rapidly in presence of sunlight. In bright rooms, the presence of background reduces direct sunlight resulting in control of algae. · First it is important to consider the size of the tank. Aquariums of smaller size will require backgrounds that do not occupy too much space inside the tank. Positioning decorative objects in the fish tank will encroach upon the space that is important for the fish. On the lower price range, you can buy colorful aquarium background sticking labels that can be pasted externally at the back of the aquarium tank. These stickers or labels are available in different designs, portraying floral life and rocks. This is a perfect choice for those who cannot invest time for mounting a background for the aquarium. But if you are using internal backgrounds, which are higher on price, make sure that the material and paints used inside the fish tank are not harmful to the fish. Aquariums are delicate settings and can be easily polluted. The next option is the three-dimensional aquarium backgrounds , which are cast into different shapes. They are made out of plastic, fiberglass or Styrofoam. Styrofoam and plastic backgrounds are suitable for small tanks, but the large saltwater aquariums use fiberglass backgrounds. Both the plastic and styrofoam backgrounds can also be cut into shapes for using them on other backgrounds of different sizes. Fiberglass backgrounds are widely used in zoological displays and public aquariums. Fish lovers who own large saltwater fish tanks can buy tailor-made fiberglass backgrounds which will present a real look of underwater scenes. These backgrounds are fixed internally at the backside of the fish tank with aquarium silicone. This silicone is made especially for use in the aquarium. As per Feng Shui principles, the presence of an aquarium can bring peace at home. It is also true that when we gaze at fish in an aquarium, it brings a feeling of calmness. Moreover, displaying aquariums with attractive backgrounds add up to the beauty of the aquarium. So, whichever option you choose for creating aquarium backgrounds, you will be definitely spending quality time and money on your favorite asset in your home. 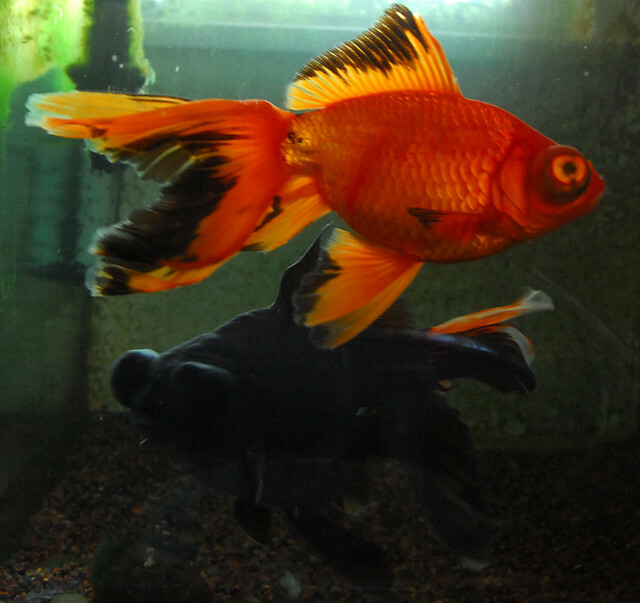 By Darren G Lawes Darren Lawes is a freshwater aquarium enthusiast. Tropical Discus Fish are a magnificent aquarium fish. They are remarkably beautiful and full of life. With their attractiveness comes a price nevertheless. The discus can be a moody fish. They aren’t similar to the Wally world cheap fish you see inside a main retail chain. Tropical discus fish will require some advanced care to keep them healthily. Please don’t let this intimidate you. With a little guidance, you can be on your way to having a good-looking tropical discus fish aquarium. Aquarium balance is the number of fish you should keep in your aquarium at one time. The broad rule of thumb should be to limit an individual discus fish per each ten gallons of water your aquarium can withhold. Discus love room to roam, using this guideline will keep your fish from feeling stressed and overcrowded. Discus prefers a tall sized aquarium. If you were to have two aquariums and one was six foot long and eighteen inches deep and the other tank being four feet long and 3 feet deep. The discus would prefer the taller of the two tanks which would be a 3×4 aquarium. Keep in mind if you have a tank like the first one I mentioned I don’t suggest you buy a new aquarium. They are merely aquarium suggestions they are not gospel. The only rule you should follow when picking out an aquarium for tropical discus fish is to make sure the tank is at least eighteen inches deep. I myself don’t advocate anything lesser than a thirty-gallon aquarium. This is just my own opinion. I don’t like to utilize anything lesser than thirty gallons because of the smaller the aquarium the harder it really is to care for the water. Plus I like to have more than 2 discus per an aquarium. 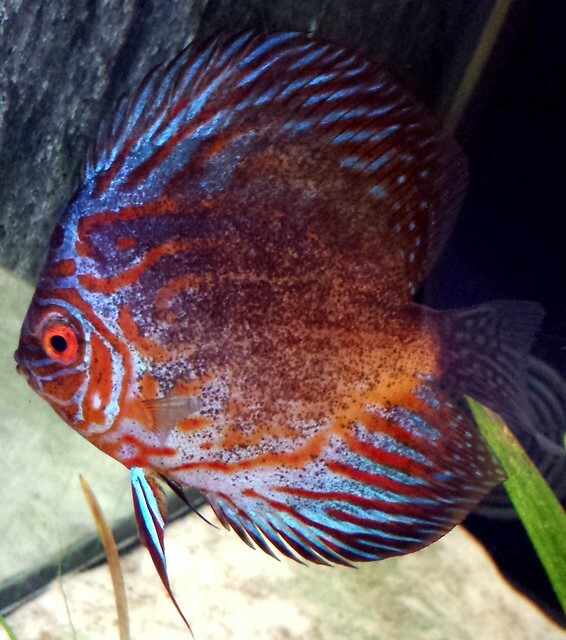 Tropical discus fish are particular eaters. It is advisable to ask the breeder what brand of food your new fish prefer to eat. Although Discus do not require any special diet they do like to eat what they have been feeding on throughout their life time. To change their diet feed them the new food in small doses. Increase the dosage for about a week to get them accustomed to the brand new food. This is a secure and stress-free way to alter their diet. Water quality is of the most important and keeping your water quality clean and stable and the right temperature is a MUST! You will want to keep the water temp between 82 and 86 degrees. Water changes are the first and obvious way to keep your water clean and stable. When making water changes only change about 15 or 20 percent of the water at a time. Do not make drastic water changes. It puts more harm than good on your discus and will cause them a lot of stress. Chemistry is a little more advanced so let me share some important factors with you. You need to test the water hardness. You need to have soft water usually between 3 and 15dh. Now don’t forget about ph. This needs to be between 5 and 6.5. PH will be the most difficult factor among first-time discus owners. This is important to learn because discus like to maintain a stable ph. Do not compromise their ph level. You will think everything is fine because the fish will live and in some case they may even breed but in reality, your fish will always be stressed and have a short life span. These are some of the most important factors you need to succeed at in order to keep tropical discus fish. Steve Jones is an expert fish keeper and owns an aquarium shop in upper Michigan. A reef aquarium is vastly different from a fish only aquarium. Not only will you need different equipment, but you will need a whole different skill to create and maintain a successful reef tank. Although you can keep fish in your reef tank, the main focus of a reef tank is to display live coral. Introducing certain species of fish can help in maintaining the reef environment and special care should be taken when selecting the appropriate species to compliment the coral in your tank. Reef tanks are primarily filtered by the live rock through a natural process. This biologic filtration is usually supplemented by protein skimmers. Protein skimmers use what is called the foam fracture process to eliminate waste matter and filter the water. A combination of biological filtration and protein skimmers is very effective at keeping a reef tank in ideal condition. Unlike fish only tanks, reef tanks require constant water movement. Different types of coral require different flow rates, but as a rule of thumb, a flow rate of 10x will be sufficient. What this means is that the flow rate needs to be 10 times the capacity of the tank (in gallons) per hour. 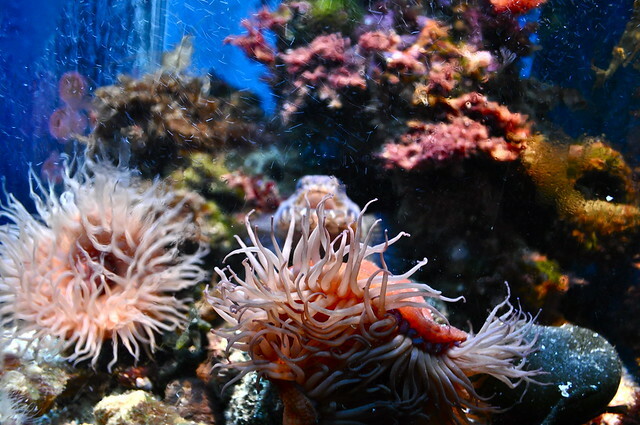 It’s important that you adjust and fine tune the flow rates to the specific coral in your tank. One of the most popular methods of creating water flow is by using power heads. They are simply small water pumps under the water that creates an underwater stream when you alternately switch them on an off. By using a wave timer, the pumps are synced to create a water flow. A newer method for creating and managing water flow is the use of submersible propeller pumps. Although they are more expensive, they use less power and can produce greater water flow compared to power heads. Another important aspect of reef tanks is lighting. While fish only tanks use lighting primarily for display, a reef tank needs light to “feed” the coral. Since the coral uses photosynthesis to stay alive, lighting is the most important aspect of keeping your coral alive. The lighting levels required for each type of coral varies widely. While some types of rock require very high levels of light, some only need low light levels. Special care should be taken when picking coral for your tank to ensure that the lighting of your tank is sufficient. As a general rule, 5 to 8 watts per gallon should be sufficient for the most common coral. Owning a fish aquarium can be a very relaxing hobby. If you have small children, they will spend many hours mesmerized by brightly colored fish swimming around and frolicking. In fact, aquariums are a great way to bring the family together, especially if you allow each of your children to pick out one special fish (of the breeds you are planning to have in your aquarium) to be his or her very own fish. Despite the relaxing nature of aquariums they are not a no care item. In fact there are many things that must be considered when choosing the proper aquarium for your specific needs. Aquariums today come in many shapes and sizes take care when selecting the one that will best suit your needs. It is always a better idea to know what you are going to be using your aquarium for before purchasing and setting it up. You do not want to have to undo all the work that goes into an aquarium because it won’t sustain the fish and plant life you have planned for it, nor do you want to kill your fish because you have a tank that is improperly set up or proportioned to house them. Once you’ve decided the basics (saltwater vs. freshwater, reef tank, or live plant tank) then you will want to consider how many fish you want to house in your tank. A good rule of thumb is to plan for one inch of fish per square foot of surface area in freshwater tanks and three inches of fish per square foot in a saltwater tank. Larger tanks require much less maintenance when properly populated than smaller tanks. The trick is to remember it is better to have less than the maximum than to go over. Having an aquarium can be a great way to relax at the end of a long workday or workweek. These pets do not require daily walking or litter box cleaning almost daily, but they are an investment and do require some maintenance. 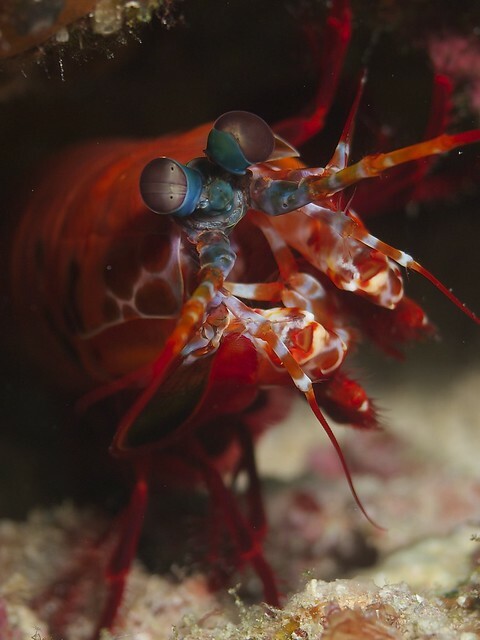 Care properly for the animals in your aquarium and it should provide you with a wealth of entertainment over the years.